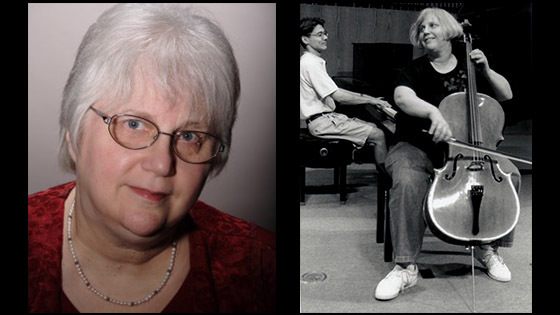 June 28, 2016, 3:32 PM · Musicians and educators around the world are mourning the loss of cellist and educator Gilda Barston, 71, who died last weekend in Chicago. A Juilliard-educated cellist, she was teacher to many cellists, as well as a teacher of teachers and powerhouse presence in the Suzuki community. Originally from New York City, Barston was a student of Leonard Rose, earning both her bachelor's and master's degrees in music from the Juilliard School -- where both her own mother, and her daughter, Amy, also graduated. A registered Teacher Trainer of Suzuki Pedagogy, Barston was crucial in pioneering Suzuki education in America, particularly as it pertained to the cello. She served as Chair of the Suzuki Association of the Americas, CEO of the International Suzuki Association and Director and Artistic Director of the Chicago Suzuki Institute. In 1998 she received a Distinguished Service Award from the Suzuki Association of the Americas for her work with the SAA Cello Committee. Gilda Barston. At right, playing a concert with pianist David Dunford. Barston also was Dean Emeritus of the Music Institute of Chicago, where she taught in both the Community Division and the Academy. "In over 40 of teaching at MIC she was a friend, mentor, leader and advocate for the highest standards in music education...Her legacy as a teacher and teacher trainer is immense," the Music Institute of Chicago posted on its website. Former students and colleagues from all over the world have been posting their memories on Facebook over the last few days. Among them: The Alaska Cello Intensive called Barston an "innovator, instigator, and inspiration to anyone," also posting a picture of her with five young students, all wearing T-shirts that said, "Cello Mob." "I'm so grateful to have known her as a studio mom, colleague and dear friend," Rachel Barton Pine wrote. "We are deeply saddened by the loss of an incomparable member of the Suzuki family, Gilda Barston," posted the Suzuki Association of the Americas. Survivors include her husband Eugene Barston, and daughters Elisa Barston and Amy Barston. The family has asked that those wishing to memorialize her donate to causes that Barston championed; descriptions and links to those can be found on this page. A memorial will take place at 1 p.m. Sunday at the Music Institute of Chicago, Nichols Concert Hall. Gilda Barston's Earthly presence and illuminating musical pedagogy shall be sorely missed, and especially when reading String Magazines familiar to all of us in the String Playing "Family"